Couplets with the content of “loving the Party,” issued by the United Front Work Department of a county under the jurisdiction of Shangqiu city. 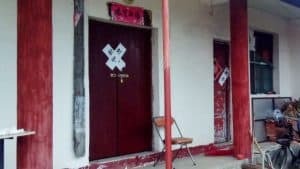 For Liu Yu, a Christian who attends a government-approved Three-Self church in Shangqiu city, in China’s central province of Henan, it wasn’t uncommon to receive a Christian-themed couplet and door painting as a Christmas gift given by her church, but after the “year of religious catastrophe” – this is what believers called the CCP’s purging of religious symbols in 2018 – in which the local government started a campaign to remove religious symbols from homes and churches, she no longer held out hope of receiving a couplet. 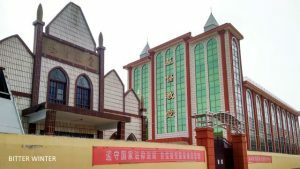 But then, surprises of surprises, in late December, Liu Yu received a New Year’s couplet from her church – only to quickly learn that it was government propaganda. The couplet read: “Firmly believe in and follow the Party. Rise from poverty and become prosperous. 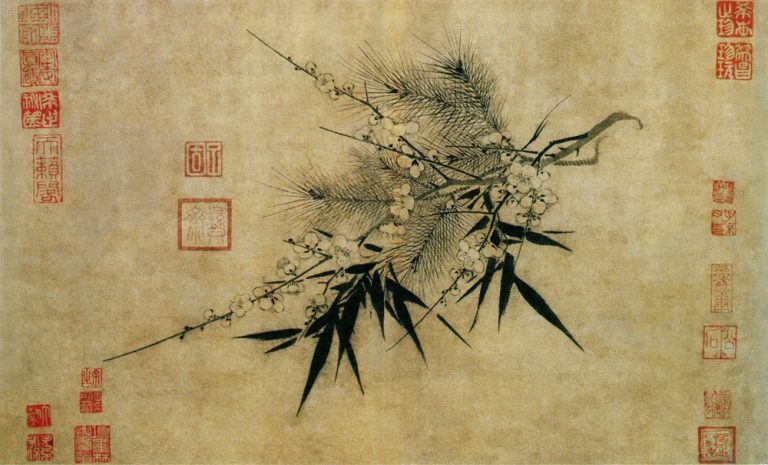 Strive for a good life.” The inscription read: “Blessings from the benevolent Party.” There was also a fú character painting (meaning “good fortune”), with the words “United Front Work Department of the County Committee” written underneath the character. “Now, the government doesn’t let people put up door paintings or couplets praising the Lord. 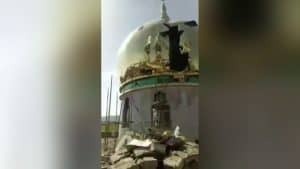 We have to post paintings and couplets uniformly issued by the Religious Affairs Bureau,” the person in charge of the Three-Self church to which Liu Yu belongs said. This isn’t an isolated incident. 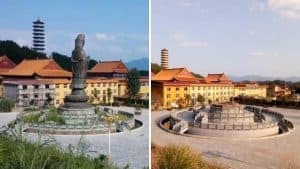 According to local Christians, after Christmas, the person in charge of another local Three-Self church meeting place went around to congregants and told them that, this year, images of Jesus were no longer being issued, but if they went to the church, they could get a portrait of Xi Jinping. 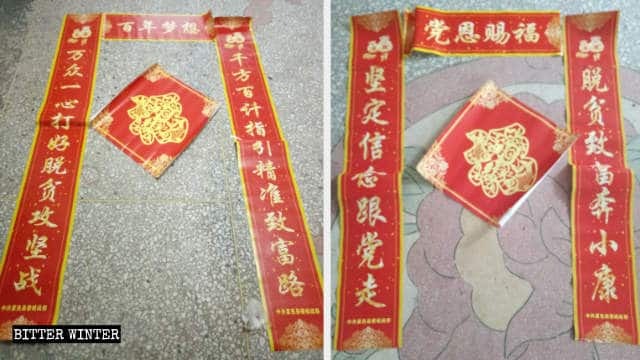 In addition to couplets, wall calendars are also common New Year’s gifts in China, and for Christians, they typically have famous Bible verses printed on them. They’re often used as a means to help spread the gospel. 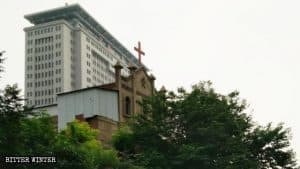 But according to Christians in Yongchuan district of Chongqing city, local stores that used to sell Christian crosses and calendars no longer dare to sell them this year. The person in charge said that selling these calendars means setting oneself against the government and they would be arrested for doing so. On December 23, 2018, believers at a house church meeting place in Henan’s Zhengzhou city went to a secluded gathering venue to celebrate Christmas under the pretext of “learning how to run a business.” The preacher carefully took out Christmas gifts that had been prepared for the believers – peanuts, candy, and wall calendars for the New Year, which, the preacher said, had been brought in from afar. And yet, these calendars could be taken away or replaced – or the owners of them could be punished. 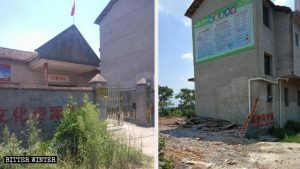 In October 2018, government personnel from Henan’s Xiayi county rushed into the home of Xiao Tang, Three-Self church Christian, and threatened to revoke his minimum living subsidy if he didn’t rip up the Christian wall calendar in his home and replace it with one that had Xi Jinping’s portrait on it. This kind of situation has frequently occurred in many parts of Henan Province. 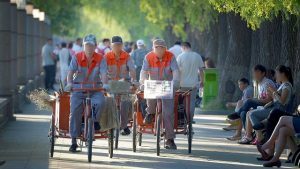 And in January last year, several teachers, as well as guards from the security office, at a middle school in Tangshan city, in China’s northern province of Hebei, were reprimanded by school leaders. The reason was that they placed Christian calendars, distributed by the Three-Self church as New Year’s gifts, on their office desks. The school leaders said that the Bureau of Education often came to the school to conduct inspections. The school was prohibited from displaying anything related to Christianity. Some Christians are worried about whether the government giving “gifts” at the beginning of the year means that, in 2019, “sinicization” of Christianity will continue to penetrate and occupy their lives.